ISLAMABAD, Pakistan -- A plane belonging to Pakistan's national carrier crashed on Wednesday shortly after takeoff from the country's north with about 40 people on board, a spokesman and the police said. According to senior police officer Khurram Rasheed, the plane crashed in a village near the town of Havelian, located about 75 kilometers (45 miles) northwest from the capital, Islamabad. There were no immediate details on casualties but Pakistan's interior ministry dispatched a team with experts on identifying bodies through DNA tests. 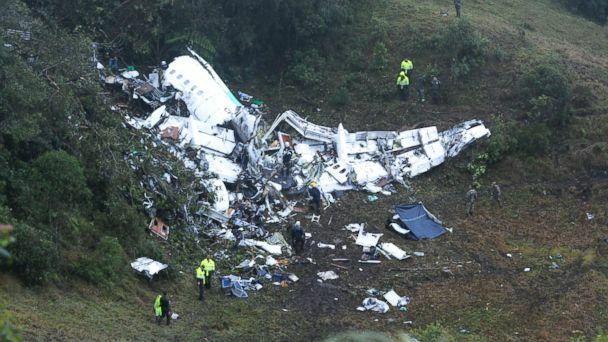 The plane was carrying the Brazilian club soccer team Chapecoense. State-run Pakistan Television showed a huge fire rising from the site of the crash. Villagers were seen standing near the site. Shortly before the crash was confirmed, Daniyal Gilani, the spokesman for Pakistan International Airlines, said their ATR-42 aircraft carrying around 40 passengers and crew had lost touch with the control tower. A local police official, Khursheed Tanoli, told state-run TV that the plane went down in a village in the northwest and that rescuers are trying to reach the site of the crash. The army said it dispatched troops and helicopters to the location. A resident of the area, Kashif Khan, told the TV that he saw the debris of the crashed plane.